For most of his artistic career, Houston-based artist Mark Flood has created collages, paintings, and sculptures, and has altered found ephemera that serve to critique exuberantly the perverse ethics of the art world. The Contemporary Arts Museum Houston is pleased to present Mark Flood: Gratest Hits, the first survey of his work with pieces dating from the 1980s to 2015. Gratest Hits shows the deep wisdom and humor of three decades of Flood’s work while ultimately revealing the true achievement of an artist who has produced many highly praised works and has an active career despite remaining barely visible at the museum level. Flood began his artistic career in the now legendary rock band Culturcide. The punk culture that birthed Flood was known for being critical of compromise. Flood similarly judges harshly the institutions of the art world–from grant-making agencies to museums–that create bureaucracies between art and the public; instead he favors the crazy democracy of passionate collectors and prickly critics, of the insulting interaction between Internet users termed flaming, and of socially irresponsible art makers. Known for his prankster antics and mocking commentary, Flood continues to challenge what he considers to be the questionable values held dear by our society in general and the contemporary art world in particular, making his ethically coherent work irreverent, ironic, and self-deprecating. Gratest Hits presents the broad range of Flood’s work in several ways: 1) Employing the grand vistas in CAMH’sBrown Foundation Gallery, Flood confronts visitors with a massive construction of hinged together paintings comprised of all of his best known genres, including two of his largest, most exquisite lace paintings in all their eye candy glory. Flood has been making his lace paintings since the early ‘90s; their process of manufacture and slightly kitschy image derived from actual lace encourages us to look at these seductive beauties with a jaundiced eye; 2) The exhibition includes site-specific installations made of absurd pseudo-posters, multi-media, ephemera, collages, text paintings, and documents from the last decade that remix pop culture and critique systems of mass cultural distributions such as rock videos and albums. The early work takes a hard look at the remixing of pop culture by critically examining the mainstream making of art and its distribution; 3) More recent paintings by Flood depict corporate and digital domain logos that have become our new landscape as most Americans spend their days staring at computer screens; and 4) Viewers to the exhibition are invited to act as critics. A mound of 5,000 “LIKE” paintings, mirroring the Facebook world we live in, can be placed anywhere in the exhibition to which viewers are drawn. CAMH will also present two screenings of Flood’s full-length movie Art Fair Fever that reveals the comic grotesqueries of the art fair phenomena. The film is set in a high-end art fair, like Art Basel Miami, and highlights what was once a subtle business of discrete exchanges of art and money that has turned into an all-out flamboyantly public affair. The fair becomes the site for life changing revelations for a group of itinerant art students. The later works referencing the art world that made Flood famous continue that critique by calling into question who is making the decisions about what is great art and whether our current system for determining great art is helpful or detrimental. The lace paintings in particular are meant to seduce the viewer through a self-consciously superficial beauty that is as easy as it is enticing. Their vivid colors, rich surfaces, and delicate patterns are beautiful even though the “trick” of their manufacture–lace applied, painted over, and removed–is made totally obvious. The fact that these paintings are offered as irresistible to passionate art collectors frees him from much of the soul-degrading job of art making, instead allowing his studio to function as a joyful school for art world sedition. Flood believes that when artwork is overly glorified it is hard to experience it as “art” per se, which is why he has referred to himself as one of the “least important artists of the 20th century,” a sentiment reflected in the misspelling of “Gratest” in this exhibition’s title. While Flood is one of the most successful artists working today, his art has not been the subject of significant scholarship until now. CAMH seeks to examine Flood’s work through a serious curatorial and philosophical lens, not as mere hometown hero-worship. This lack of scholarship about Flood’s work may be a result of his challenging the market-based logic of galleries and the complicity of museums, as well as his profound questions about who legitimizes art and artwork in public perception. Aware of the profound contradiction of his views and this survey, Gratest Hits highlights Flood’s uncomfortable relationship with success and praise and pokes fun at the art establishment and what it means to be a “great” artist. “Never has an exhibition enjoyed so many moments of extreme visual beauty, cheek by jowl with crude humor and aggressive, roughly-rendered texts to create a visual roller coaster ride,” says Bill Arning, CAMH Director and organizing curator for the exhibition. Mark Flood attended Rice University (1976-1981). In 2013, Luxembourg & Dayan Gallery in New York City held a survey of Flood’s work of the ‘80s, bringing together more than 100 paintings and collages. Flood’s work can be found in the collections of the Modern Art Museum of Fort Worth, the Dallas Museum of Art, the Menil Collection, Museum of Fine Arts, Houston, and the Birmingham Art Museum. His work is widely exhibited internationally. Mark Flood lives and works in Houston, Texas. Mark Flood: Gratest Hits is supported in part by Melissa and Albert Grobmyer and Cynthia Toles. This exhibition has been made possible by the patrons, benefactors and donors to the Museum’s Friends of Steel Exhibitions: Director’s Circle – Chinhui Juhn and Eddie Allen, Fayez Sarofim and Ms. Louisa Stude Sarofim; Curator’s Circle – Dillon Kyle Architecture, Inc. and Mr. and Mrs. I. H. Kempner III; Major Exhibition Circle -A Fare Extraordinaire, Bergner and Johnson Design, Jereann Chaney, Sara Paschall Dodd, Marita and J.B. Fairbanks, Greg Fourticq, Barbara and Michael Gamson, Brenda and William Goldberg, Blakely and Trey Griggs, George and Mary Josephine Hamman Foundation, Leslie and Mark Hull, Jackson and Company, Anne and David Kirkland, KPMG, LLP, Beverly and Howard Robinson, Robin and Andrew Schirrmeister, Yellow Cab Houston, Wallace Wilson and Michael Zilkha. The Museum’s education and outreach programming has been made possible by the patrons, benefactors and donors to its Families of Steel Programming: Vera and Andy Baker, Mary and Marcel Barone, Louise D. Jamail, Kinder Morgan Foundation, Robert and Pearl Wallis Knox Foundation, Leticia Loya, Marian and Speros Martel Foundation Endowment, M.D. Anderson Foundation, Elisabeth McCabe, Andrew R. McFarland, Nordstrom, Nancy O’Connor,Cabrina and Steven Owsley, Ms. Louisa Stude Sarofim, Texas Commission on the Arts, Kim and Gerard Trevino and Bridget and Patrick Wade. Funding for the Museum’s operations through the Fund for the Future is made possible by generous grants fromChinhui Juhn and Eddie Allen, Jereann Chaney, Marita and J.B. Fairbanks, Jo and Jim Furr, Barbara and MichaelGamson, Brenda and William Goldberg, Leticia Loya, Fayez Sarofim, Robin and Andrew Schirrmeister and David and Marion Young. The Museum’s operations and programs are made possible through the generosity of the Museum’s trustees, patrons, members and donors. 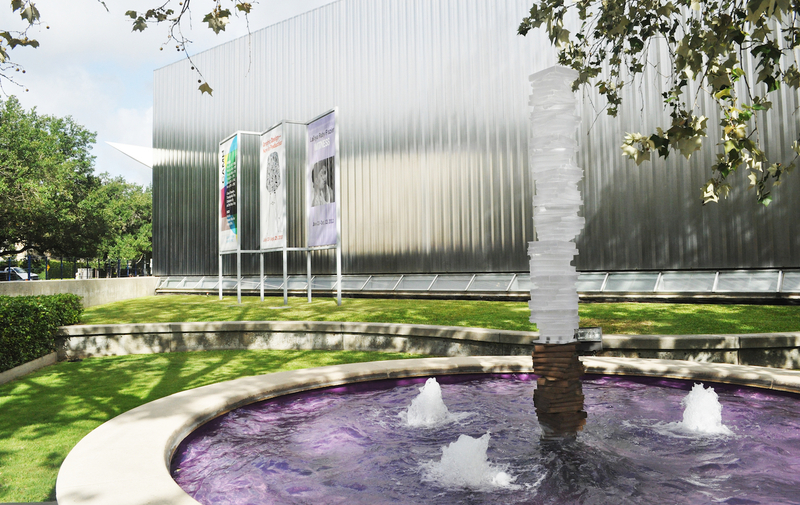 The Contemporary Arts Museum Houston receives partial operating support from The Brown Foundation, Inc., Houston Endowment, the City of Houston through the Houston Museum District Association, the National Endowment for the Arts, the Texas Commission on the Arts, The Wortham Foundation, Inc. and artMRKTProductions. CAMH also thanks its artist benefactors for their support including Michael Bise, Bruce High Quality Foundation, Julia Dault, Keltie Ferris, Mark Flood, Barnaby Furnas, Theaster Gates, Jeffrey Gibson, Trenton Doyle Hancock, Jim Hodges, Joan Jonas, Jennie C. Jones, Maya Lin, Julian Lorber, Robert Mangold, Melissa Miller, Marilyn Minter, Angel Otero, McKay Otto, Enoc Perez, Rob Pruitt, Matthew Ritchie, Dario Robleto, Ed Ruscha, Cindy Sherman, Shinique Smith, John Sparagana, Al Souza, James Surls, Sam Taylor-Johnson, William Wegman and Brenna Youngblood. Mark Flood: Gratest Hits is curated by Bill Arning, Director of the Contemporary Arts Museum Houston. Mark Flood: Gratest Hits is accompanied by a significant monograph of Flood’s work. The illustrated color catalogue includes an essay by CAMH Director and organizing curator Bill Arning, as well as Carlo McCormick, El Topito, and Scott Indrisek. The catalogue is designed by Russell Etchen and edited by Betsy Zinn. This catalogue is made possible by a grant from The Brown Foundation, Inc.